Cook pasta per package directions, leaving al dente. In a skillet large enough to hold the sauce and pasta, melt 3 tbs butter over medium-high heat. Lightly salt and pepper salmon, if desired. Place the salmon skin-side up in the pan and cook until the bottom turns white and golden brown, about 3-4 minutes. Gently flip the fish cook on the other side 2-3 minutes more to cook though. Remove salmon from pan and set aside. It's ok to leave some pink in the middle as the salmon will cook a little more in the pasta. Reduce the heat to medium then add 2 tbs butter and let melt. Scrape the pan to loosen any browned bits. Sautée the shallots until they soften and become translucent, about 3-5 minutes. Sprinkle in the dill during the last minute. Add the cream to the skillet and let come to a simmer. Cook for 2 minutes to let thicken and reduce, stir occasionally as needed. Whisk in grated cheese to ensure it melts and incorporates evenly. Toss pasta in sauce. 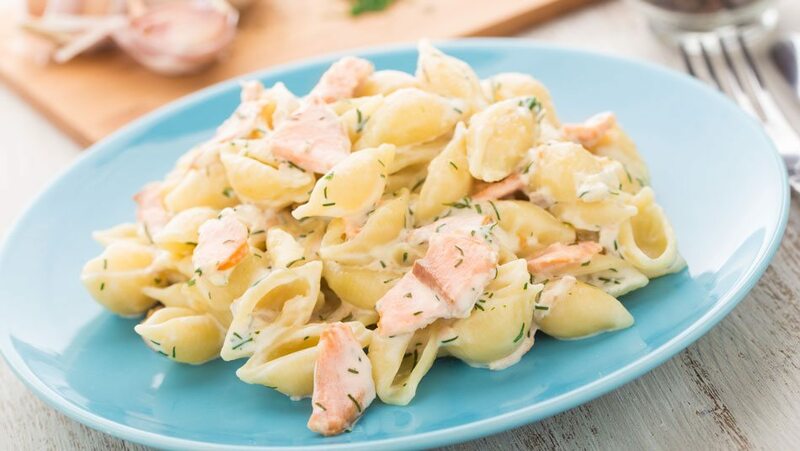 Add salmon to sauce and pasta, flaking and chunking the salmon as you go. Toss well and serve warm.